The concept of food pairings is one that I’ve learned a great deal about from my wife, Amber deLaurentis, a great pianist, vocalist and songwriter who happens to be an amazing artist in the kitchen as well. In food pairing, one chooses a garnish for the way it brings out the flavor in a salad or a cut of meat; or one chooses a beverage for the way it brings out the flavor in the food it accompanies. Walking bass was also a common technique in the Baroque era; the bass lines in J.S. Bach’s orchestral music, for example, are often nearly as strong and independent as the melodic lines further up in the contrapuntal texture. A microcosm of this bass independence can be heard in the Gavotte from his English Suite in G Minor. 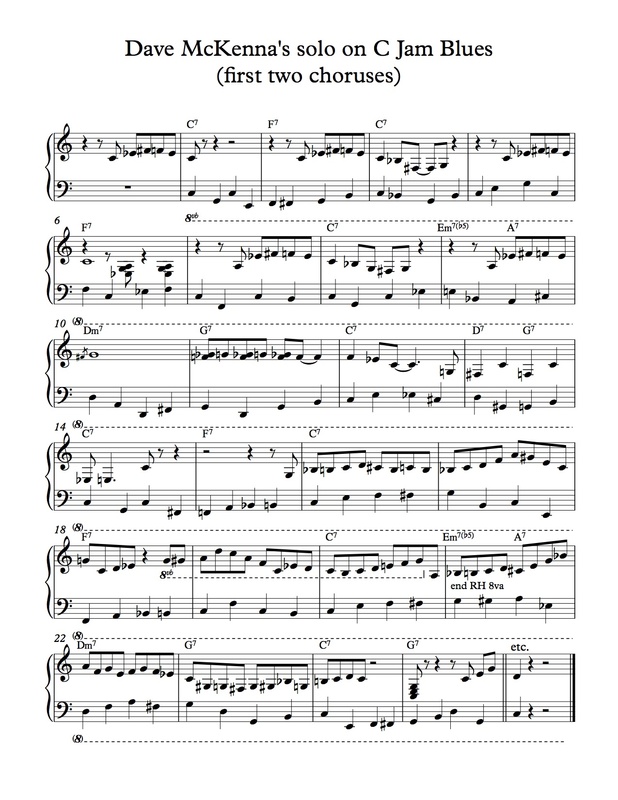 Although the left hand bass line alternates between quarter-note walking and brief flurries of eighth notes, there are enough eighth notes in the right hand line that I find it the piece comparable to a jazz situation with walking bass and an improvised eighth-note line. Finally, I discovered the Allemande from Handel’s Keyboard Suite in B Flat Major through a recording by Keith Jarrett, who first became known as a jazz pianist but is equally known today through his classical recordings. This piece combines the same kind of quarter-note walking bass and with an eighth-note-based melody that is slightly less ornate than that of the Bach Gavotte. I encourage pianists looking to develop their facility with walking bass to try practicing either the Bach or the Handel side by side with my McKenna transcription. In an upcoming post I will look at how great jazz pianists combine left hand walking and right hand chordal comping in duo situations.